Work on the Lotus Temple began in 1978, on a 105,000 square-metre site. It was completed in 1986. The temple was designed by architect Fariborz Sahba and built by the ECC Construction Group of Larsen & Toubro Limited. The Lotus Temple stands in Bahapur in the south of New Delhi, far from the busy downtown district of the Indian capital. 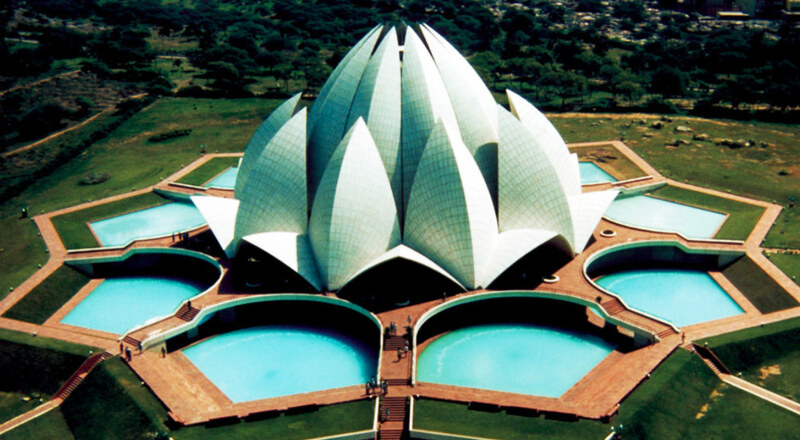 The temple is a Bahai house of worship and its lotus-flower form symbolises purity and sanctity. In bright sunlight the enormous flower-shaped building is white, while at sundown it takes on violet hues propitious to meditation. Structurally, the temple is formed by 27 enormous marble ‘petals’ that enclose the interior. Under its central concourse, the temple stands 40 metres high. Made of white cement, white marble and sand, the temple exudes a sense of purity which is an essential element in its design. It can hold over 2,000 people and is surrounded by 9 ponds spanned by the same number of walkways, creating the impression of a lotus flower sitting in water. Each of these walkways leads to one of the 9 doors into the temple. The temple and its ponds are set among spacious gardens. The whole complex occupies a site covering 105,000 square metres. The temple has won a host of architectural awards for its originality, creativity and authenticity.